McDonald’s Hot Apple Pie was a favorite of mine when I was growing up. These crispy pies are hard to beat. The crunchy crust and the warm sweet filling inside is a match made in heaven. You can recreate this famous recipe on your own. 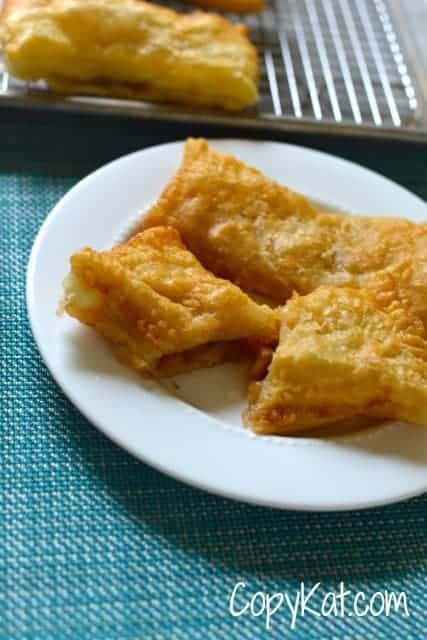 I remember growing up with these delicious hot fried apple pies. They were a staple, why in 1992 McDonald’s would discontinue this menu item I have no idea. If you are dining at McDonald’s, you may not be offended if the apple pie was fried rather than baked. The new baked version isn’t crisp, I find it rather doughy, and honestly it isn’t a favorite of mine. I can’t remember when I have ordered an apple pie. We can recreate this McDonald’s Hot Apple Pie at home. We are going to use 2 medium sized apples. I like to use two different types of apples. I always pick a Granny Smith apple, and then I pick another type of apple, it could be a Honey Crisp, a Red Delicious, Jazz apple, or any other type of your store has available. By using two different types of apples the result will be a more intense apple flavor. I am also using a package of puff pastry dough. Most stores carry the Pepperidge Farm brand, and I find it works very well. For this recipe, you will use the whole package. You will also need to fry these, I really like use my Grand Pappy Fryer, it heats consistently, and it will store so I can reuse the oil. You can also use a stock pot filled a about 3 inches deep with oil. Resting the pies on a wire rack to drain instead of paper towels will help keep the pies nice and crisp. If you want to keep these warm before serving I highly recommend in keeping them a warm 200 degree oven. These McDonald's Apple Pies are fried and not baked. Dice apples into small pieces. Place apples in a pot over medium heat. To the pot add butter, brown sugar, cinnamon, nutmeg, allspice, vanilla extract, lemon juice, and salt. Cook apples for about 10 to 12 minutes or until the apples are softened. Defrost the puff pastry according to package directions. Cut puff pastry into 8 squares. Spoon 1 heaping tablespoon of cooked apples onto one side of each one of the squares. Brush water on the edge of each one of the squares and fold the squares over on each other. Use a fork to crimp the edges together. Add enough oil to your cooking utensil to cover the bottom 3 inches. Heat oil until 350 degrees. The oil will be ready when you drop a small piece of dough in the oil and it cooks rapidly. Cook pies 2 at a time, for about 1 minute on each side. Remove when both sides are golden brown. When pies are removed from hot oil place pies on a wire rack to drain excess oil. If you want to keep the pies warm hold in a 200-degree oven until you are ready to serve. My family really enjoyed these. We still have the “old school” McDonald’s fried apple pies here in Ireland, they are a long standing favourite. This recipe looks delicious too. Yes, you could bake these. I fried these because the old pies were fried not baked 😉 If you bake them they would be a lot like the flakey turn overs you get from a bakery. Thank you very much. I am sure you will love this pie when you give it a try. Coach Outlet Beecher Legacy Canvas paper series gets a new feather to high specification, high compact spinning canvas material. His new tissues, contrast color inside, bag, without food, while still Coach Outlet Online pleasing elegant appearance. Glove leather is a return to the traditional ties COACH. Coach Factory Outlet Beecher Legacy Canvas Hamptons Tote large handbags, restored COACH original tag – simple flash-day, rather than the edge of the drum version with Coach Baby Bags hand pressure. You hang the bag comes with rivets, and the flat leather flip through Coach Crossbody Bags the tapered handles the details. The details of this remarkable COACH retro inspired design. Sounds great! How many sheets of puff pastry does this take? Not in ingredients list. Thanks for this old favorite recipe. Sorry, missed the cooking tips section! Jumped right to the recipe, and then read the blog. Oops! No problem it takes 2 sheets I hope that helps. It takes the whole package of the pepperidge farm puff pastry.